Have you heard of a Scottish genius called Nick Nairn? Growing up in Canada, I had not – until I found his big glossy book at a bookshop in Inverness a few years ago. I carted New Scottish Cookery back across the pond and he has joined us for quite a few dinners here in the new world. Scott especially has made outstanding (and time consuming!) dishes from Nick's recipes. I'm talking baked filet of halibut with cabbage, smoked bacon and a tarragon cream sauce, not to mention lasagne of smoked haddock and peas, which is much more elegant than it sounds and involves a homemade vegetable butter sauce. There's also a genius spicy salmon broth that comes together very quickly and has lemongrass and chillies practically bursting out of it. For my birthday weekend this year, Scott offered to make me a new recipe from New Scottish Cookery. I opened the book with great anticipation, but only got three recipes in. 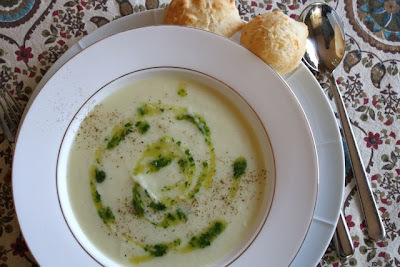 The bright green herb oil drizzled over the white cauliflower and mull cheddar soup got me. Looking at it, I thought that maybe, just maybe, this might be the cauliflower cheese soup I have been searching for all my life. 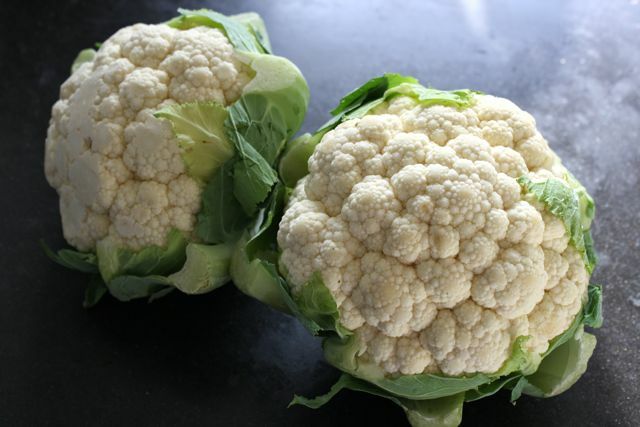 This might be the one that wouldn't break into watery pockets of bland cauliflower purée. This might be the one that would be supremely creamy and still have lots of cheesy flavour. This might be it. And it's so simple that we are now making it regularly on weeknights. It really just has five ingredients: onion and garlic softened in a good amount of butter, cauliflower and some kind of nice cheddar cheese. 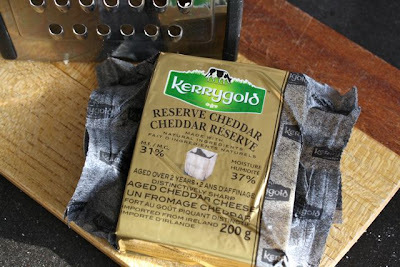 We like an Irish cheddar called Kerrygold Reserve, although it is possible I was seduced by the handsome wrapper. Yes, we've made the herb oil too, but you know what? Aside from looking pretty, it's not really necessary. The soup itself has so much cheesy-cauliflower flavour that it doesn't need any fancy herb oil to gunk up my immersion blender. Adding a bit of chopped parsley also looks pretty and is a lot less work. Thank you, Nick Nairn, for your new Scottish cookery. Warm a Dutch oven or heavy-bottomed pan over medium heat. Add the butter and let it melt. Add the onion. Stir often and cook until it's translucent, golden and almost softened, about 8 minutes. Stir in the garlic and cook for another minute. While the onion and garlic are cooking, fill a kettle with 1 litre (4 c.) of water and set it to boil. Add the cauliflower and boiled water to the onion and garlic. Bring it to a boil, and simmer until the cauliflower is tender, about 20 minutes. Take it off the heat. Purée the soup with an immersion blender until it's quite smooth. Return the pot to the element and turn the heat on low. 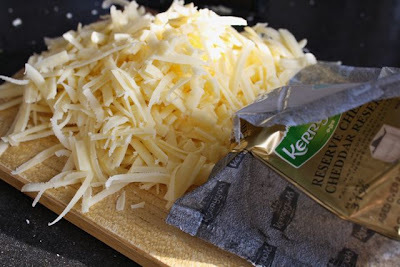 Add a small handful of cheese and stir it in until melted. Repeat until all the cheese is melted in. (If you add it all at once, it will clump.) Turn the heat off. Serve with fresh cracked pepper and chopped parsley on top. 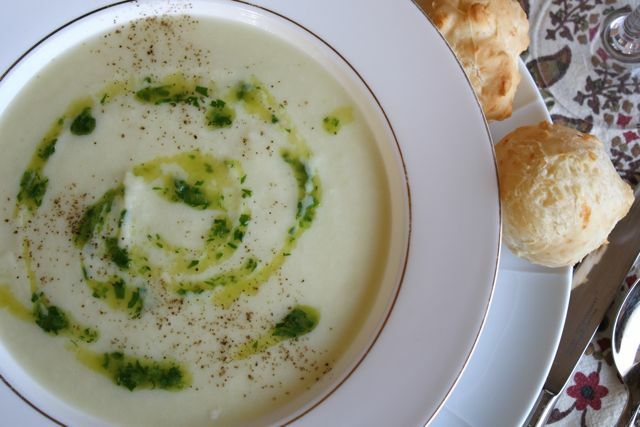 Note: Nick Nairn says that if you'd like to freeze the soup, don't add the cheddar. Instead, add the cheddar when you reheat it. Too bad you haven't been able to find the TV series -- I will have to start searching, too . . . It sounds like something I would love!